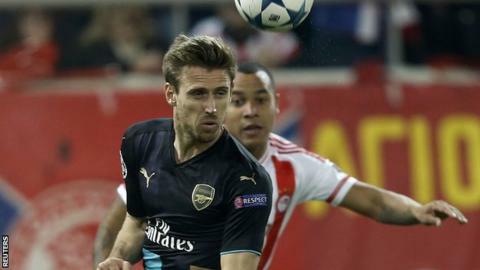 Arsenal's Spanish left-back Nacho Monreal has signed a new long-term contract with the Premier League club. The 29-year-old joined the Gunners from La Liga side Malaga in January 2013. Monreal has made 113 appearances for Arsenal in all competitions, including all 22 league matches this season. "I met the boss (Arsene Wenger) three years ago and I have a really good relationship with him and I'm really happy with him. For these reasons I extended my contract," he said. Wenger said: "He is a very important player at the club because he can play left-back and centre-back. He has the consistency in his performances that is requested at the top level." The exact length of the contract has not been revealed. Monreal started in last season's FA Cup final victory over Aston Villa.